Two models were released: the Z-110 (pictured) which could display color graphics and was delivered with monochrome or colour monitor, and the Z-120 which had a built-in monochrome (green, amber or white) monitor. Z-Basic was the only language supported by Zenith directly. It was an extra-cost option on most packages. It could handle colors and graphics. The professional keyboard was quite complete with 95 keys, a separate numeric keypad, 7 editing keys and 12 function keys. All the keys could be redefined by software. A wide range of expansions could be added to the Z-100. They came from Zenith directly, or from third companies, installed by dealers: one or two 1 MB 8" disk drives, 5, 10 or 20 MB hard disk, 64 and 256 KB memory modules, expansion card with 6 x RS232 connectors, analogue/digital conversion card, etc. The computer also had five S-100 bus connectors which offered a lot of possibilities. The Z-100 was a very fast machine, one of the fastest in its category in fact. It was thus often used in a multi-user configurations, using Forth-Multix or Prologue operating systems. The 8088 ran at 5 MHz initially, and then later at 8 MHz. The first boards could handle 192K RAM, but later boards could have up to (and use) 768K on the main board. The default Video RAM was 64K, but allowed 3 banks for up to 192K for full color. 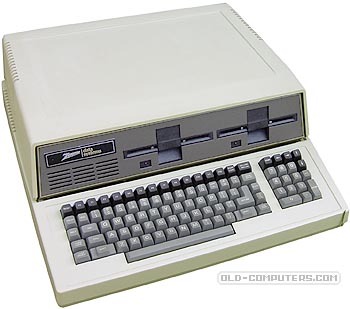 The disk controller had support for four 5.25" and four 8" floppy drives, though OSs including CP/M and Z-DOS supported only two of each. The earliest models (pictured here) had full height, but later models had half height drives. There was a hack later on that allowed for four 5.25" drives under MS-DOS 2.x. A Winchester hard disk (5 or 10 MB) could also be connected. These models were also available as the Heathkit H-100 series, sold then as kits. In these versions the monitor and video boards were preassembled, but user actually had to assemble the controller board and the analog video circuit on the monitor board. KEYBOARD Full-stroke keyboard with separated numeric keypad and function keys. 95 keys. see more Heathkit / Zenith Z-100/110/120 Ebay auctions !